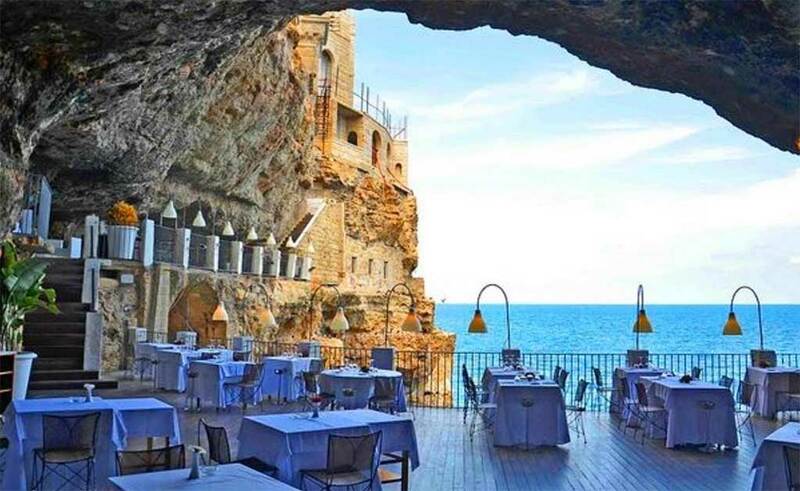 When I recently saw photos of this 4-star Italian hotel and restaurant, Grotta Palazzese, they were so beautiful I had to share this find with you. It opens for the 2017 season on March 16. So if you’re planning a spring break or summer trip to Italy this year, make sure to read this whole article so you can reserve a spot soon! Have you ever been inside a grotto (or cave) that opens onto the sea? I lived in Italy for five years in my 20s, and I had the opportunity on several occasions to visit a grotta, as they’re called in Italian, and it was always so magical. I love the way that the crisp sounds of the lapping water bounce off of the stone walls. There’s something very protected and primal about being hidden inside a fortress of rock like that, safe from the power of the ocean beyond. 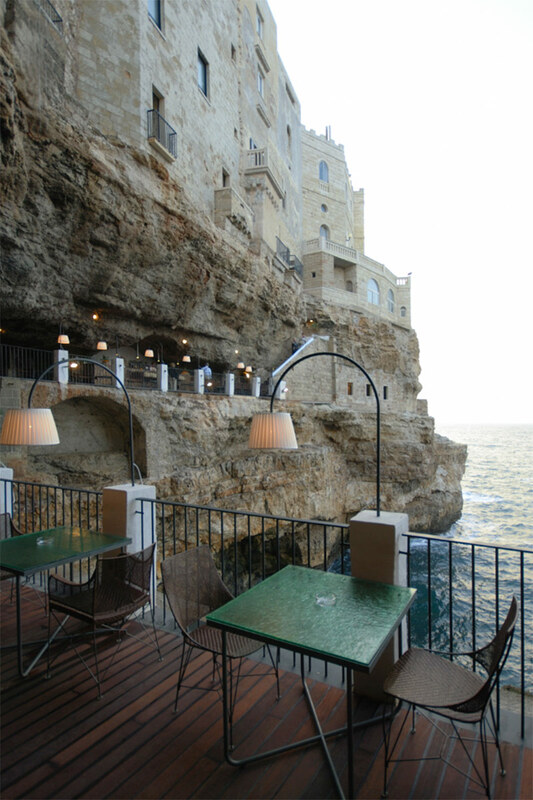 You can find this restaurant in Polignano A Mare in Puglia, almost 17 miles from Bari, a Medieval town. Apparently locals organized festivals in the cave even back in the year 700! Up above, in the hotel rooms, guest have reported feeling the waves crashing against the rocks. The restaurant is open each year only from around Easter to October. You get to it by descending 64 steps. They serve lunch and dinner, and in summertime you can kick back in the Sea Lounge and gaze at the Adriatic. My fellow Americans beware: Flip-flops and shorts are not allowed in the restaurant—management forbids them and requires “casual elegant” attire instead. When I went on the website, the option for English was pointing to pages in Italian. Since I’m fluent in Italian, I thought it best to include the email address so you could email them to make a reservation (called a prenotazione), which people say is necessary. Their email is grottapalazzese@grottapalazzese.it. The address is Via Narciso, 59. 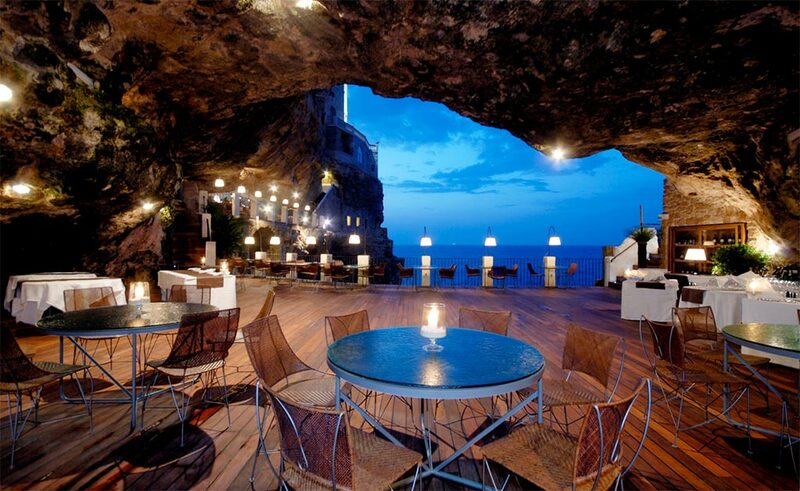 Have you been to Grotta Palazzese? Please share your experience by leaving a comment below.